I'm not sure if this has already been answered but multiple searches resulted in nothing and an internet search also revealed nothing. Does anyone know what Zenyatta's stride length is? I've always been impressed when watching her run and was curious considering her stride just looks so big compared to some of the other. I'm not aware of it being measured or even Mike Smith taking an estimate at it. (Calvin did for Rachel). However the stats are there and visually it looks large but no where as massive as even Secretariat. An interesting website looking at the degree positioning of the horse's legs at full stride found here, however I disagree with their view of MOW. He was said to have a substantial stride as well despite their claims. Zenyatta at 5-yrs old measured at almost 17.2 hands and as of the fall of 2009 weighed in at 1,217 pounds which is significant for a race-ready mare. Using a photograph from her victory in last year's Ladies Classic, Robert, Zenyatta appears to have a stride angle of approximately 91.5 degrees (in comparison to Secratariat's 110 degrees). Apparently, there has been some measuring going on. Compare to secretariat and man o' war. There are other articles, I just need to find them. Actually, somebody I know did a measurment, counting strides and steps. I'll have to find it. It was quite mind-boggling, so I don't doubt the above. I'll post that when I find it, too. "Apparently, there has been some measuring going on. Compare to secretariat and man o' war. There are other articles, I just need to find them. Here is one below. Also, I know somebody who counted strides and steps. I'll have to find it. It was quite mind-boggling. I'll post that when I find it, too. "According to Equix, which analyzed the biometrics of racing thoroughbreds, the average race horse has a stride length of 23.5 feet. Secretariat’s was measured at 25.2 feet, which helped contribute to his greatness. I got a request from a Community member to do a similar stride-length study on Zenyatta as I did with Rachel. What I discovered in the process was nothing short of astonishing. Mindful that Zenyatta’s most recent victory was the Vanity Handicap at Hollywood Park – a race she won last year under a similar 129 pound impost – it seemed a likely candidate for the study. According to plans I found on the internet, the stretch at Hollywood Park, like all Left Coast tracks, measures a paltry 991 feet -- 25 percent shorter than Churchill Downs; 33 percent shorter than Hawthorne; and a staggering 36 percent shorter than Fair Grounds -- which helps explain why speed is so dominant in California racing, and why so few closers are able to win without perfect rides and exceptional ability. In the Vanity Handicap in both 2009 and 2010, Zenyatta required the identical 39 strides to complete the 991 feet, an average stride length that factors-out at a mind-numbing 25.41 feet per stride -- longer even than the great Secretariat. St. Trinians, by contrast, required 42 strides to traverse that same distance, for an average stride length perfectly in keeping with the norm at 23.59 feet. Next, I went back and watched the Breeders Cup Classic of 2009 at Santa Anita, whose stretch is even shorter than Hollywood Park’s at only 900 feet. It took Zenyatta only 35.5 strides to complete the distance, an amazingly consistent 25.35 feet per stride. Even after a mile-and-a-quarter, she galloped-out like she wanted to go around again, an indication that perhaps the Left Coast’s ridiculously short stretches are the reason so many people believe we haven’t yet seen Zenyatta fully extended, nor will we until she runs the 1,234.5 feet of CD’s stretch in this year’s Breeders’ Cup Classic. Very cool, thank you for posting that. Still hard to suggest the extended stride for Z that is on par with Secretariat. Her stride length was mentioned during pre-race coverage of her 2010 Breeders Cup race. I remembered paying attention -because I myself wanted to know how her stride measured up. 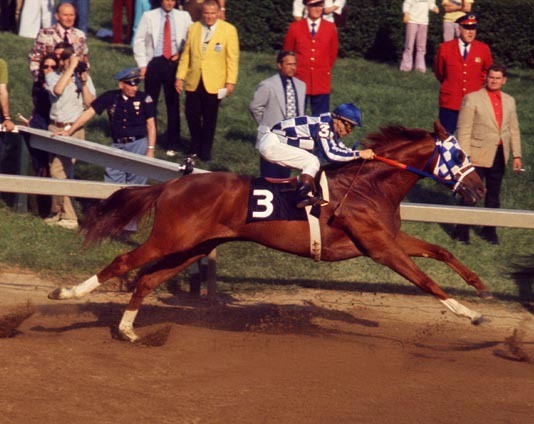 I can't recall the exact number (but I think I still have it recorded), but do remember that they commented about it being greater than Secretariat's stride. As soon as I can commandeer the television away from the men (watching football), I'll skip thru and see what measurement they give. IIRC, the Breeders Cup coverage said she had a 26' stride. According to the Mayan calendar, the world will not end this week. Please plan your life accordingly. When I looked at the site I also thought that something was wrong with the comparison. The measurements didn't seem at the same point in the stride. It's an apples and oranges comparison, as you have pointed out far better than I could. You have to have the same conditions, same engagement, same jockey behavior, and exact same moment in the stride. That Zenyatta photo really brings it home how much force is on one delicate leg, with her big body. Nothing to add about stride length, just was struck by how evocative those photos are. Fear is the rocket sauce. I wonder how big her heart is.. I bet it is comprable to Secretariats!